Deeply engaged with the history and strategies of Surrealism, Shana Lutker explores the avant-garde milieu of Paris in the 1920s, a place and time in which radical artistic ideas occasionally met with physical violence and artists sometimes attacked one another to defend ideologies and honor. Her work pulls together other artists’ works, fabricated objects, everyday artifacts, and personal relics to appropriate and question historical narratives, a project that stems from her long-time investment in the writings of Freud. 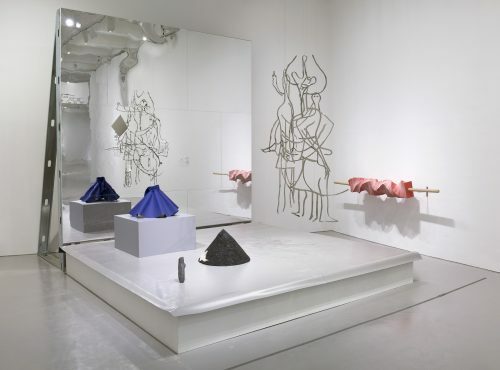 Her solo exhibition Shana Lutker: Le “NEW” Monocle, Chapters 1–3 focuses on stage set–like installations of sculptures based on the historic fistfights between Surrealist artists that took place on the stages and streets of Paris. Join us as Lutker speaks about her research and work as part of the Museum’s ongoing Meet the Artist series.